Zao Organic Cleansing Milk for Eyes gently cleanses your make-up and impurities accumulated throughout the day. Ideal for sensitive eyes, its gentle formula respects the fragile eye contour area. Its composition is rich in cornflower hydrolat to ensure a real comfort. 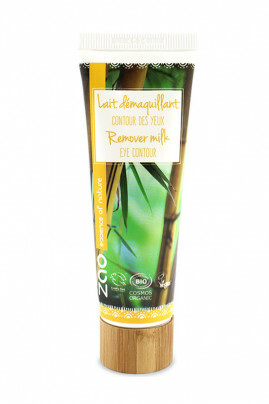 With Zao Vegan Eyes Cleansing Milk, your eyes are perfectly cleansed! Cleanses even the most sensitive eyes ! Before going to bed, apply eye cleansing milk with a cotton pad to remove make-up. A 100% natural composition to take care of your sensitive eyes! 36% OF THE TOTAL INGREDIENTS ARE FROM ORGANIC FARMING AND 100% OF THE TOTAL IS OF NATURAL ORIGIN. Organic sesame oil (Sesamum indicum (Sesame) seed oil): Rich in essential fatty acids, this oil is both restructuring and softening. It provides all the nutrition the skin needs without leaving an oily film. Organic babassu oil (Orbignya oleifera seed oil): This oil has extraordinary regenerating and antioxidant properties. Its fine and penetrating texture facilitates make-up removal while providing the hydration and softness the skin needs. Organic cornflower hydrorolate (Centaurea cyanus flower water): Its soothing and revitalizing properties make this hydrolat a real care ingredient for tired or delicate eyes.